1. Directory Title: In this field the name of the Article directory is displayed. 2. User Notes: In this field the user can add notes for the selected directory. 3. Directory Details: If the website selected requires login for article submission, then the “Has Login form” checkbox is check marked by default. 4. If the website accepts HTML, then “Accepts HTML” checkbox is marked. 5. 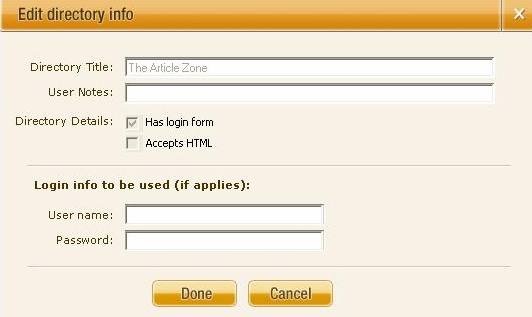 Login Info: If the website requires login before article submission, then the User name and Password fields can be filled and saved. Now, whenever the directory for which the information of login is saved will automatically fetch the information from the Edit popup and fill in the required fields. In case the information is not automatically filled due to some reason. Click on “Fill Form” to serve the purpose. iii. Google PR: The Google Page Rank of each of the article directories. v. Last Submitted: The date that you last submitted your article to the particular website directory. viii. Login: Whether or not the article directory requires you to login to their website before submitting your article. If the login information for the site is entered in the Edit popup, then green dot will appear under login section for the directory. ix. Auto Submit: Whether the article can be submitted automatically to the directory selected, which has complete login info. x. Favorites: The column of Favorites enables you to add the article directories to your list of favorites. To add a particular article directory to the list of favorites you can click on the icon of favorites. A user can disable the same by again clicking on the icon against the particular article directory. xi User Notes: A field that displays the notes entered by the user in the Edit popup for the Directory.